Drive Features – How Low Can You Go? Here in metro Detroit, a popular subject for editorials and panel debate is why it seems the passion America once held for the automobile is in decline. Does the legislation and message coming out of Washington promote the development of appliances on wheels? Are manufacturers too risk-adverse and infested with a “bean-counting” mentality to ignite a passion dormant only through a lack of interesting product to awaken it? While both are undoubtedly true to some degree, it seems that young people in particular have simply a found a new, more seductive love. In truth, even the most dedicated ‘60’s gear head would find it hard to pick up a wrench if he had the world in the palm of his hand. Mustang vs. Camaro? More like I Phone vs. Droid. While internet access, hardware advancements and better software are all prerequisites for the smart phone market, fitting all that functionality in the most usable (i.e. thin) form factor is an equally important factor in their explosive growth. Packaging products like this is about attention to the smallest detail, including what screw type is used. Further, the screw is itself a study in packaging. Thread size and screw length can be chosen over an almost continuous spectrum, with the thread dimensions standardized in the most applications. On the other hand, choices of head and drive style have greater variation in both performance characteristics and in dimensions relative to standard threads. The drive style should allow easy insertion and not fail during insertion prior to screw shank failure, either within the head or the bit. The limitations to shrinking head diameter, namely crushing the material beneath it or pulling the screw through the hole, are not directly related to the fastener design but to joint requirements. On the other hand, head height is usually dictated largely by the depth of bit engagement required to provide safe driving, and therefore can be a differentiator in screw design. One drive style, with which many readers are unfamiliar, was developed recently with short bit engagement as a key feature. 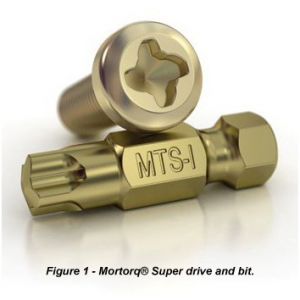 The Phillips Screw Company developed the Mortorq® Super drive (Figure 1) to check the box on all the features customers want in a drive, but the potential to decrease head height below the that of current head styles is what Phillips believes can provide particular benefit to manufacturers of personal electronics, and other packaging challenges. Shown in Figure 1, the drive geometry was developed with the goal of increasing contact area without increasing the tendency for coating fill. The non-symmetric nature of the contact surface in the tightening and loosening directions is claimed to provide functional benefits. Mike Abbott, Director of Technical Sales and Licensing, visited our office recently to discuss a possible test program aimed at comparing the capabilities of Mortorq® Super to other competing drive styles in micro-sized screws like #0-80 and #2-56. Just as manufacturing and inserting screws of this size require a combination of incremental and fundamental changes relative to larger sizes, the details of how to measure their capability carries a similar set of challenges.